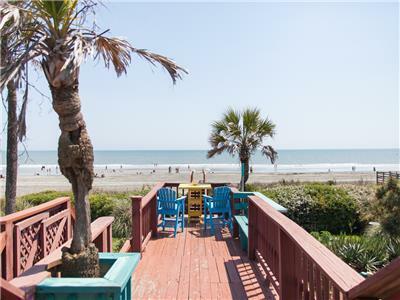 Complete with an elevator, gourmet kitchen, beach front access, top quality furnishings & incredible views this home is one of the finest Folly Beach has to offer. 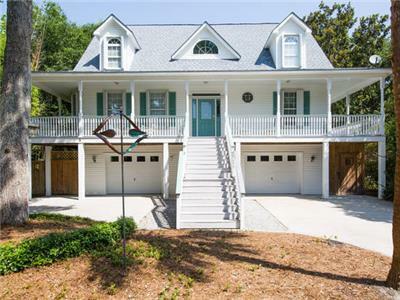 If you are looking for a high end home that can handle a large family and yet have enough "Space" for everyone to have a good time then this is it. 3 Bedrooms have Ocean Front Views with Deck access and all 3 of those rooms having King beds The other 3 rooms have a King, Queen & "Kids" room with 4 single beds as well as a pull out twin sofa. All the furniture and decor for this home has been updated with top quality beds, elegant indoor furniture and awesome outdoor furniture. The home was custom built to be a great family getaway and it is so warm and inviting that you just can't help but to smile when you walk in. The two huge decks facing the ocean provide endless views of the Atlantic Ocean that never get old. 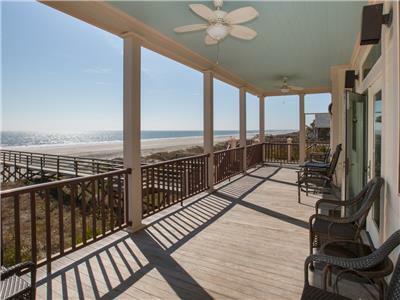 The beach sand in front of this home is also very nice with plenty of sand at high tide too!!! You are with in walking distance of the big county park at the end of the island which has life guards and awesome nature views. You are also with in walking distance of Sunset Cay Marina which has a fun little store were you can grab a cold beverage and we can even arrange a slip rental if you want to bring your boat for the week. Event fees apply. A permit must be acquired from The City of Folly Beach if more than stated occupancy of 15 is surpassed and you must consider parking. Carpooling and/or arranging a shuttle for your guests will be necessary. Please do not book for an event without calling and speaking with a property manager. FYI, for safety reasons we do not have the gas fireplaces turned on. This was a well appointed gorgeous house! The staff were very attentive to all of our needs. 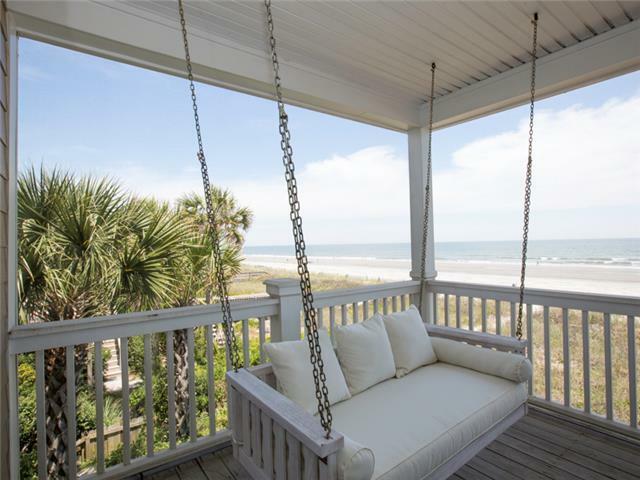 I would definitely return to the house and Folly Time rentals! Beautiful home! We all want to go back!! What a fabulously maintained property! The only suggestion would be to have more dish towels on hand and black wash cloths. We ate in every night and had the perfect amount of kitchen items. The appliances are first class. Is there a place you could put more towel rods? We made do with hanging them on doorknobs upstairs. All 12 women plan to return in two years. Thank you! We stayed in Gypsy Tide for a week for our son's wedding in Charleston! I can't tell you how pleased we were, from the minute we starting planning our vacation Tom and others had been nothing but responsive, pleasant, and helpful! The house was beautifully decorated, well stocked with kitchen items, towels, parking, beach toys... and the setting was amazing. The oceanside screened in porch was wonderful too. We will definitely work with Follytime again and hope to be back at Gypsy Tide soon. We can't thank you enough!